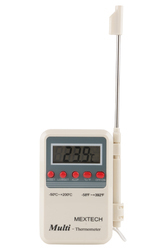 Our organization is engaged in offering a huge range of digital thermometers. These products are manufactured in compliance with international quality standards. Our products are available in easy to use, attractive and light weight designs. These thermometers are mend to give most accurate results. Best suited for personal or clinical purposes. Temperature Range -50C to 300C (-58F to 572F). Fahrenheit and Celsius degree selectable. On, off, hold and / buttons. Large measurement range from -50-300 (-58-572). 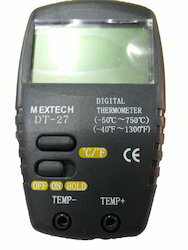 Our clients can avail an array of Handheld Digital Thermometer ST9269. These products are manufactured in compliance with various industrial standards. 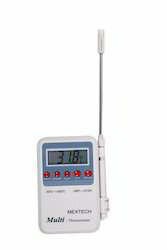 It is mainly used in dispensaries and other allied places to measurement of temperature . This thermometer is designed and manufactured using quality-approved raw material under the vigilance of our experienced professionals. 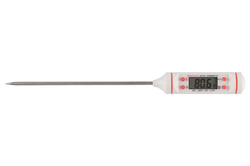 Provided thermometer is available in different specifications to meet the diverse requirements of our esteemed clients. 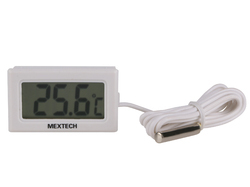 Clients can avail this digital thermometer from us at rock-bottom prices. We are prominent trader of a huge range of Digital Thermometers ST9283.These products are available in easy to read, fast response, beep alarm thermometers. Our products comes with one hour auto shut off feature. These Digital Multimeter are made from superior quality of raw material which ensure durability at its user end. These Digital Multimeter are appreciated by large number of clients. These products are available in market at economical rates.